Tea is a popular, non-alcoholic, stimulative beverage. It is prepared from leaves of the plant –“Camellia Sinensis”. Camellia Sinensis is an evergreen plant, which grows mainly in tropical climates. It needs minimum 127 cm of rainfall but water should not stag in the field. Tea plant needs acidic soil. Tea plants are pruned, so that more buds and leaves are grown. These buds along with two leaves attached are collected for further processing of tea leaves. 1. Collection of Raw tea leaves or Plucking of green tea leaves: The buds along with two leaves are plucked. Required chemicals for good tea found more on buds and young leaves. 2. Withering: leaves are moisture removed or dried. In this stage leaves become soft and some positive chemical changes are done. Leaves become oxidised and caffeine content increases. 3. Shredding: tea leaves are cut down in different sizes & styles. Different sizes give different kind of tea, at the end. 4. Rolling: soft, black, shredded leaves are then crushed into small sizes and rolled them to small particles. A special kind of machine is used in this stage, which is known as CTC. 5. Fermentation: this is the vital process which gives the tea leaves its final characteristics of flavour, colour, liquor strength etc. 6. Drying: fermented tea leaves are then quickly dried by dry hot air. This stage should be fast, otherwise tea will lose its good flavour. 7. Sorting and Grading: dried fermented leaves are ready for tea preparation. Depending on the size of tea leaves, length of fermentation, coarseness of leaves etc. dried fermented leaves are then sorted in different grades and separated. 8. Packing and Storing: different grades are packed as per the industry requirement. Airtight packaging in dry, cool place is done. Packaging io different size and volume is done, and stored in a dark clean room with fresh air, until shipment. Tea is a natural product. It does not have any artificial colourings, preservatives or flavourings. It has no carbohydrate & fat content. Tea contains Caffeine which works as a gentle stimulant. 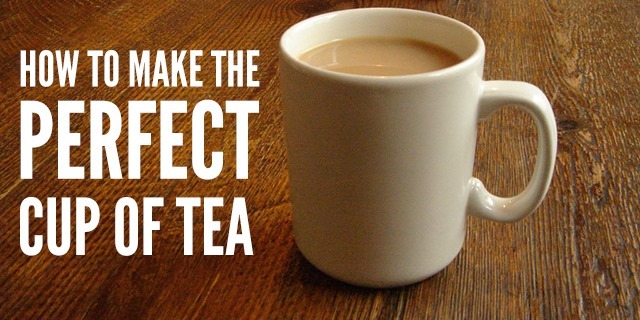 A cup of tea contains around 30 to 90 mg of caffeine. Tea also contains very small amount of theobromine (similar to caffeine). Tea is also a good source of manganese, potassium, fluoride. A little amount of Vitamin A, B1 and B2 are also found in some types of tea. Tea leaves should be stored in a clean dry and well ventilated store room in average room temperature. It is normally available in a airtight package with an expiry date. After opening the package tea leaves should be transferred to a steel container with a close lid. Tea should always be stored away or separate from other materials, because tea leaves can easily be affected by other aroma or flavours. – As a stimulative beverage in breakfast, in evening snacks or in hi-tea. – As an option of non alcoholic beverage in light parties and get together. – As a stimulative beverage in an elaborate menu, at the end. – As a social custom or formalities in meetings or get together. – Tea liquor is sometimes used in making varieties of cocktail or mock tail. – As a refreshing beverage, when served chilled, without milk, in summer menu. Teas are available in market in various packages of 50gm, 100gm, 200gm, 500 gm. etc. Also in the form of tea bags, this contains 1.5gm or 2gm of tea leaves. Catering organisations often buy small packages, to avoid dullness over the time. Otherwise cardboard packages of 42 to58 kg are also available. Some of the popular tea brands of India are – Tata Tea, Brooke Bond Taj Mahal, Brooke Bond Red Lebel, Brooke Bond Taaza, Lipton, Godwin etc. There are more than 1500 blends of tea and tea grows in more than 31 countries. Tea leaves are normally identified by the name of the place it cultivated or Origin. Like Assam Tea, Darjeeling Tea, Kenya Tea, Ceylon Tea (Srilanka), Nilgiri Tea etc. Tea leaves are also classified by the processing of the leaves. 2. Green Tea is plucked, withered and rolled. It is not oxidized because during the rolling process, oxidation is prevented by applying heat. For green tea, the fresh leaves are either steamed or pan-fired (tossed in a hot, dry wok) to a temperature hot enough to stop the enzymes from browning the leaf. Simultaneously, the leaves are shaped by curling with the fingers, pressing into the sides of the wok. The leaves are then rolled and swirled-countless shapes have been created, each with a different taste. The leaves are then given their final firing to fully dry them, after which they are done. The liquor of a green tea is typically a green or yellow colour, and flavours range from toasty, grassy (pan fired teas) to fresh steamed greens (steamed teas) with mild, vegetable-like astringency. 3. Oolong Tea is one of the most time-consuming teas to create. It utilizes all of the five basic steps, with rolling and oxidizing done repeatedly. 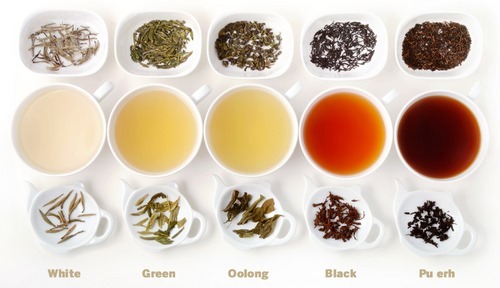 Oolong is a complex category because it’s so broad: It can be described as half-way between green and black. These teas are anywhere from 8% oxidized to 80%. The leaves are rolled, and then allowed to rest and oxidize for a while. Then they’ll be rolled again, and oxidized, over and over. Gentle heat is applied to slow the enzymes. Over the hours (sometimes days), it forms good aroma and flavour. Oolongs have much more complex flavour than Green or White teas, with very smooth, soft astringency and rich in floral or fruity flavours. Oolongs are more popular to tea drinkers. 4. Black Tea also utilizes all five basic steps, but is allowed to oxidize more completely. Also, the steps are followed in a very linear form; they are generally not repeated on a single batch. The tea is completely made within a day. The brewed liquor of a Black tea ranges between dark brown and deep red. Black teas offer the strongest flavours and, in some cases, the greatest astringency. Black teas are the only style of tea regularly consumed with milk and sugar and are the most popular bases for iced tea. 5. Flower / Scented Tea: The base of flower tea can be black, green or whatever the color. Then ingredients like flower petals might be added. Flower tea is becoming popular now a days. Example of flower tea is Jasmine Tea. 6. Pu’erh Tea (pu-ARR or pu-ERR) is a completely different art. It first undergoes a process similar to Green tea, but before the leaf is dried, it’s aged either as loose-leaf tea or pressed into dense cakes and decorative shapes. Pu’erh is a fermented tea. Depending on the type of pu’erh being made (either dark “ripe” pu’erh or green “raw” pu’erh), the aging process lasts anywhere from a few months to several years. Very old, well-stored pu’erhs are considered “living teas”, just like wine. They are prized for their earthy, woodsy or musty aroma and rich, smooth taste. 7. Teasan is used similar to tea, looks like tea, but no tea leaves are added, instead some other herbs are treated as like tea leaves. 1. Use only good quality loose leaf or tea bags. 2. Always use freshly drawn boiling water. Water should contain good amount of oxygen. If water is boiled once, it should not be used. 3. Measure the tea leaves properly. Use 1 tea Bag or 1tea spoon (approx. 2 grams) for each cup. 5. Temperature of water should be 212oF, i.e. –boiling Water, when preparing Black, dark Oolong and Herbal tea. And use cooler water -180oF, when steeping more delicate teas, such as Green, green Oolong and White teas. Boiling water if allowed to sit for 5 minutes will have dropped to roughly 180°F. Water that is too hot will cause a delicate tea to taste overly bitter. Water that is too cool will cause a tea to taste flavourless and weak.